Ureteropelvic junction obstruction (UPJ obstruction) is a congenital abnormality in which the ureter is obstructed or kinked near its insertion into the renal pelvis. 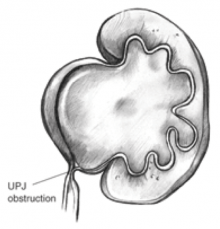 UPJ obstruction is the most frequently diagnosed cause of urinary obstruction in children and is commonly diagnosed during the prenatal ultrasound evaluation. Less commonly, a child will present later in life with pain, urinary tract infections, or an abdominal mass. The diagnosis of a UPJ obstruction is usually made with a combination of imaging studies including a renal ultrasound to assess the degree of hydronephrosis or swelling of the kidney, a voiding cystourethrogram to rule out associated vesicoureteral reflux, and a renal scan to determine the function of the kidney and the transit time of urine out of the collecting system.